In Supreme Court Hypocrisy Panderbear presented evidence that 4 of the 5 most conservative justices since 1937 are currently on the Supreme Court, part of the devastating legacy of Presidents Bush I and II. A study by the Constitutional Accountability Center shows that Corporate America controls the U.S. Supreme Court through its five conservative justice majority. Panderbear recommends reading the complete CAC study. The study included a total of 53 cases from early 2006 through May 2010. Justice Sotomayor's votes have been included in Justice Souter's whom she replaced. The 5 conservative justices are Alito, Scalia, Roberts, Thomas, and Kennedy. The most startling result to Panderbear is illustrated in the chart plotting the percentage of cases in which each justice supported the U.S. Chamber of Commerce position in 5-4 or 5-3 decisions. 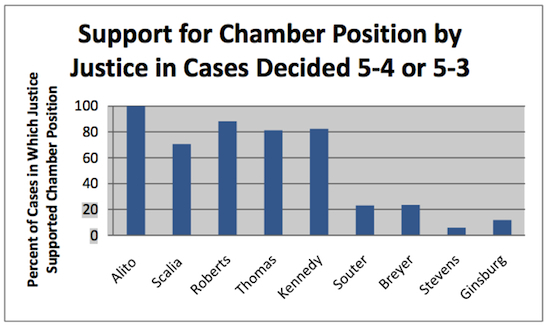 The conservative justices voted for the Chamber of Commerce position 84% of the time, while the other justices did just 16% of the time. Panderbear's conclusion from the data is that this activist conservative U.S. Supreme Court, the Roberts court, is ruled by and for and panders to corporate America. For Panderbear the evidence presented in this CAC study is redundant since the damning 5‐4 decision in Citizens United v. Federal Election Commission, holding that corporations have the same constitutional right as individuals to spend money to influence elections. We are currently reaping the poisonous harvest of that politically motivated decision and corporate windfall.